ATI Systems, a leader in the mass notification industry, and Platinum Award Winner in the 2018 ‘ASTORS’ Homeland Security Awards Program for Best Mass Notification/Siren System, is pleased to announce the company’s next generation REACT5000 Central Control Unit (CCU) provides advanced monitoring and control features that enhance the entire line of ATI Mass Notification Products. Acoustic Technology, Inc. (ATI Systems), a world leader in the design, manufacturing, and installation of reliable emergency warning and notification systems for the campus, community, industrial, and military markets, is pleased to announce the company has been selected as the 2018 Platinum ‘ASTORS’ Award Winner for Best Mass Notification System Hardware by American Security Today for the REACT 5000 Communication Control Unit. ATI was also honored with the platinum award for Extraordinary Leadership in Homeland Security. ATI’s next generation REACT5000 Central Control Unit (CCU) provides advanced monitoring and control features that enhance the entire line of ATI Mass Notification products. ATI Systems has become synonymous with state-of-the-art Mass Notification Systems (MNS) and has a reputation of producing systems that are reliable and secure. The new REACT5000 Central Control Unit (CCU) is the latest addition to ATI’s award-winning Mass Notification line and provides enhancements that add value in a wide range of applications. An intuitive Graphical User Interface (GUI) provides a better user experience, while multiple form factors provide mounting flexibility. Additional support for communication links for both IP and non-IP, along with enhanced encryption options, provide a more robust and secure system. The REACT5000 Central Control Unit (CCU) provides enhanced control and monitoring of ATI remote units such as the Indoor Speaker Unit (ISU) and the High-Powered Speaker Station (HPSS). It serves as a key component in the creation of a powerful and flexible Mass Notification System (MNS). The REACT5000’s advanced features leverage the proven capabilities of the ISU and HPSS. An intuitive touch screen interface allows for the activation of tone alerts, recorded voice messages or live PA, and displays the status of remote units, and also makes for a convenient standalone controller for a small system or a subsection of a larger system. The REACT5000 may also be used in conjunction with ATI’s MassAlert™ software running on a PC or server. MassAlert™ is ATI’s net-centric software that utilizes state-of-the-art technology to provide the most advanced, reliable, and secure Mass Notification System (MNS). It includes a user-friendly Graphical User Interface (GUI) to instantly alert the public and provide instructions during an emergency. The geographical map overview provided by MassAlert allows for complete control of complex multi-location MNS applications, particularly if the user chooses a larger desktop or wall mount video display. The REACT5000 supports multiple simultaneous communication paths to provide the most robust notification system available. It provides improved support for Ethernet/IP but also improves support for non-IP wireless communication. As part of the ongoing effort to stay ahead, the REACT5000 family of CCUs is based on a modern ARM micro-controller which includes hardware acceleration for encryption and IP stacks with the latest security options. In addition, all ATI Remote Terminal Units (RTUs) and CCUs have built-in batteries so the system works even if local power or communication networks are down. Tarek Bassiouni, Business Developer, ATI Systems accepting the 2018 ‘ASTORS’ Extraordinary Leadership Award at ISC East. “We are honored to be recognized for our achievements in American Security Today’s distinguished 2018 ‘ASTORS’ Awards Program,” said Tarek Bassiouni, Business Development Manager for ATI Systems, who attended the 2018 ‘ASTORS’ Homeland Security Awards Luncheon on Wednesday, November 14, 2018 and accepted the awards for ATI. 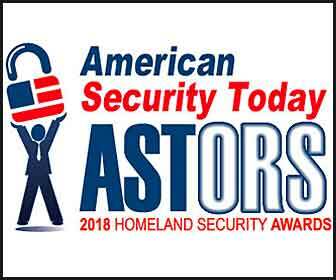 *ATI Systems is also a Premier Gold Sponsor of the 2018 ‘ASTORS’ Homeland Security Awards Program, and a 2017 ‘ASTORS’ Platinum Award Winner. ATI has developed innovative wireless systems that provide intelligible voice and visual warnings via a simple and compact hardware design, user-friendly software, and the latest communication methods, including radio frequency, IP Ethernet, and satellite technology. Additionally, ATI’s Mass Notification Systems easily integrate with other warning systems to provide more complete solutions. ATI is an ISO 9001 certified company. For more information about ATI, visit atisystem.com. ATI Systems, Attivo Networks, Automatic Systems, Desktop Alert, and Royal Holdings Technologies.